After taking into account suggestions from the public, Tokyo Metro has finally settled on some J-Pop jingles for train departures. What would you do with an old train car? 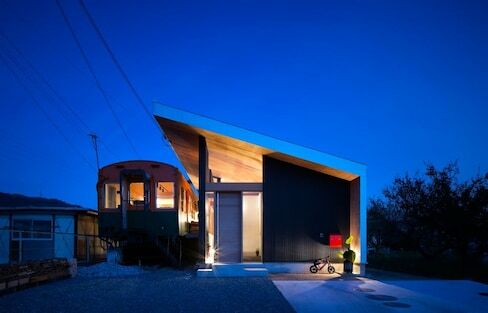 If you're architect Takanobu Kishimoto, you incorporate it into part of a house! 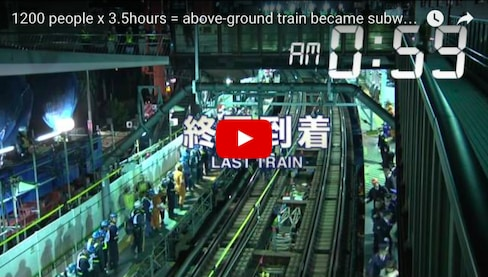 Watch this amazing video to see how 1,200 station workers in Shibuya shifted the tracks of the Toyoko Line from above ground to underground in just one night in March 2013. 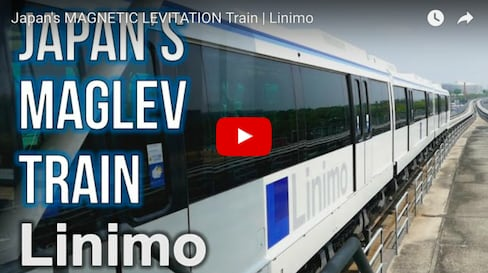 YouTubers Rachel & Jun introduce Linimo, one of only two maglev (magnetic levitation) trains presently open to public use in the world, the other being in Shanghai. This super slow motion video taken at Shinjuku Station freeze makes mundane life pop like living sculptures. We have no idea where these adorable cats are heading, but they sure do look like they're enjoying their train ride! Want to enjoy some of Tokyo's best trainspotting sites? Here are five fantastic places to get the best views of Tokyo's trains without even entering a station! In many parts of Japan, train stations aren't merely gateways but places of interest. At Kishi Station in Kinokawa City, Wakayama Prefecture, it’s a cat that attracts people and makes the trip worth their while. Discover one of Japan's pioneering 'tori-tetsu'—a.k.a. train photography otaku! A visit to Japan is incomplete without some travel on the Shinkansen, Japan’s bullet train network. With a new line connecting Hokkaido, there isn’t a better time to see all of Japan in the blink of an eye! Enjoy gorgeous works of art while weaving through the Niigata countryside on the new contemporary art bullet train. But you'd better act soon, because tickets are selling like hotcakes! Can You Sell Homes with Dozing Commuters? Japanese people often sleep on the train. It doesn’t just happen during the morning rush hour, either: it happens pretty much at any time of day. This cute video connects train dozing with the importance of having a nice home at the end of the ride. Trains in Japan can become extremely packed—to the point where they feel like they're bursting at the seams! But if you follow these tips, you'll learn how to ride those crowded trains like a pro! Opened in 1912, this beautiful station lost relevance as early as the late 1920s, but has now been renovated into a multi-purpose facility filled with restaurants, cafés and retailers. Are you into collecting train stamps, or is taking pictures of trains more your thing? No matter what your passion for trains may be, the Japanese language has a word for it! Where Do Old Trains Go? Most people envision Japan's trains as shiny, advanced, and new—but where do the old trains go when they're no longer needed? Japan's railway companies have created multitudes of passes to attract passengers, which can be confusing and off-putting at first to novice riders. Let's check out some of the passes so you'll be ready to ride the rails! The Yamanote Line is Tokyo's, if not Japan's, most iconic rail line, and also one of its busiest. It's time for a special Yamanote trip—a journey through its past! Communters and tourists alike can now enjoy free Wi-Fi while riding on Tokyo's Toei Asakusa Line, with more lines to come. Japan is famous for its modern trains, but it's also a great lover of traditional steam engines.